As a big fan of keyboard shortcuts, I was very pleased to stumble across today’s Windows download, AddToRun. I often find myself using the WinKey+R shortcut to run a program or a command line. In case you didn’t know the WinKey+R launches the run menu prompt. The problem is that the list of available shortcuts available from Run Menu are mainly for programs that are Windows accessories and system files. AddToRun lets you create your own run-box shortcuts. In this example, I’m going to create a shortcut to the Steam gaming client program. AddToRun is a portable app 100 Portable Apps for Your USB Stick for Windows and macOS 100 Portable Apps for Your USB Stick for Windows and macOS Portable apps let you take your favorite software anywhere via a flash drive or cloud storage. Here are 100 of them to cover your every need, from games to image editors. Read More ; meaning that you don’t have to install it but just download and run it. You can run it directly from a flash drive or from within the 7z archive file (use the free 7-Zip to open the archive) as it requires no installation. 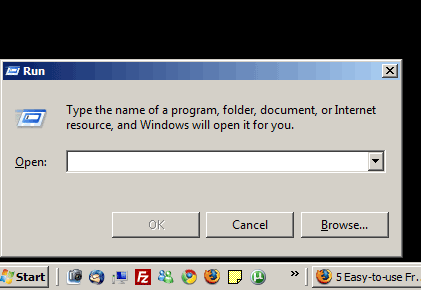 Select the program for which you will create the shortcut by browsing to the program executable file. Type the alias you wish to use and click Add. Your shortcut will be available right away. Hit the WinKey+R and type the alias to check it out. The alias you create works just as well as opening the program file directly, including any switches or parameters you add to the command. Let’s say I’ve created an alias “ff” for Firefox. Then, I can type “ff google.com” and Firefox will open and load Google.com. Obviously, you can substitute Google.com with any other site you like. AddToRun’s advantage over program launchers Top 7 Unknown Free Launcher Applications for Windows Top 7 Unknown Free Launcher Applications for Windows Read More such as Launchy is that the created aliases work without the need to have the launcher program running. That helps if you’re the kind of PC user who likes to squeeze as much performance as possible out of your system. If you have another favorite method of launching programs or creating similar shortcuts, please give us some examples in the comments. Thanks a lot for this - I have really wanted to get this running but am unsure about it. Or you could forget all this completely and use SlickRun which works great..
Why? You just need to add the exe file to "HKEY_LOCAL_MACHINE\SOFTWARE\Microsoft\Windows\CurrentVersion\App Paths" in registry. Or you can make a shortcuts folder somewhere and add that folder to your global PATH so you can launch them via the Run menu: (allthingsmarked.com/2007/05/21/howto-keep-your-desktop-clean-yet-maintain-quick-access-to-programs/) check it out. Hmm. I'm supposing all is does is create a shortcut to the program in Windows folder? what i used to do was create a shortcut in "C:\WINDOWS\system32"